Is this crazy? Or does it make sense? 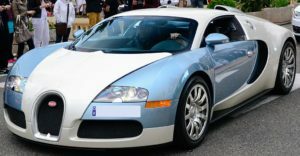 Bugatti, a small car company bankrolled by Volkswagen (VW), has brought out the Veyron 16.4 with a top speed of 248 mph – and the car was tested at the speed on the fastest track Volkswagen could find in Europe! Nowhere else would allow the car to get to that speed and be timed for long enough to say it actually could do this. The previous record for a production car was 242 mph round the Nardo track in Italy – and that required a great deal of skill by the driver to keep the car on the banked track! This sort of speed – and the power to get there – are pretty much off the planet, but since then, other companies – with a fraction of the resources of Bugatti – have decided they should aim for 250 mph. ‘What for?’, you might ask. I guess it is a bit like saying the moon is there so let’s go there. 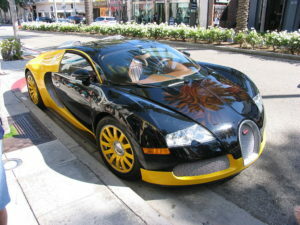 The Bugatti Veyron is a very impressive car, powered by a W-16-cylinder 8.0 liter engine developing 1,001 bhp. The ‘4’ stands for the four turbochargers needed to boost the engine to that amount of power. The whole Bugatti project was the idea of Dr Ferdinand Piech, then chairman of the VW Group. He wanted VW to build a car to showcase technology and to move the goal posts so no one could get close. Evidently, during testing this engine was proved to be reliable when producing 1,200 bhp.The car does showcase technology. The engine is similar to the W-12 installed in the Audi A8 and S8, and in turbocharged form in the Bentley Continental GT and Flying Spur.The gearbox is also based on VW Group technology. It is a seven-speed sequential box with automatic or manual shifting. It has a dual clutch arrangement so that when you change gear the power continues to be transmitted all the time, one clutch disengaging exactly at the moment the other engages. Stunning technology that really delivers benefits.The same concept is available in six-speed form in the VW Golf, Audi A3 and S3. It is called DSG. Of course, the Bugatti has a special version of this concept, made by Ricardo, a powertrain specialist in the UK. The Bugatti has a carbon fiber structure, suspension like a racing car, and two large air intakes in the roof to keep that huge engine cool. Of course, the engine is mounted behind the driver and passenger but forward of the rear wheels. If you are wondering why four-wheel drive is needed, just think about it. With two-wheel drive there would be 500 bhp going through each tire! Most makers of supercars and exotic cars think that 300 bhp per tire is plenty.Ok, so the Bugatti was timed at 248 mph, and reaches 60 mph in less than 3 seconds. Did the other makers of exotic cars give up, and say: ‘Well, we can’t match that’?No, Pagani, produced the 650 bhp Zonda F with an option of 700 bhp. Saleen upped the power output of its S7 to 750 bhp, while Ferrari produced a few FXXs with 850 bhp, and Maserati also has a version of the MC-12 developing 750 bhp or so.On the other hand Koenigsegg decided not to pursue the power race for the time being at least. After all its CCR has a 806 bhp engine, and was timed at 242 mph. Instead, Koenigsegg has introduced the CCX which is designed to meet US regulations and is a more practical street machine. Others have decided to go for maximum power including one of the tuners of Porsche 911s. Then, a small British company is introducing a car with a turbocharged 7.0 liter V-8 with a power output of 1,000 bhp. They say that the engine could be tuned to 1,200 bhp. More will follow down this route to madness. Me? I’d go for the 500 -600 bhp myself in a car that really handles and is very, very responsive. Like a Pagani Zonda or an Ascari KZ1. Paul Cooper is an automotive and technical writer who specialises in high-performance cars, and runs a web site about exotic cars, http://www.1st-exotic-supercars.com, where you can learn more about exotic cars.